“We are aware of the benefits of the current time we live in. Today we can choose a similar toy from various producers, however, we do not usually take into consideration on the chemical composition and its possible harmful effects. This campaign reminded me to think twice before I buy a new toy for my child, and to choose smartly”, said one mother during the “The fight to know!” campaign". The Quick Start Programme project “Capacity Building and Strategic Partnerships for Chemicals Safety in the Republic of Serbia” strengthened capacities and collaboration of competent authorities in charge of chemicals management, human health and consumers’ protection, civil society organizations and other stakeholders. It has enabled better implementation of legislation on chemicals and raised the public awareness. A campaign, “The fight to know” was undertaken in the country to exercise consumer’s right to be informed regarding presence of substances of very high concern in articles. It included a survey for retailers of particular articles, followed by laboratory analysis of the purchased articles. Based on the results of the campaign, extraordinary inspection’s controls were conducted. The articles containing non-allowed concentration of phthalates (>0.1%) were removed from the market and further production and distribution was banned. One of distributers, whose article contained non-allowed concentration of phthalates, informed the consumers through his web page about the hazards posed by the article and the possibility to return it. Several purchased articles were returned to the distributor who pointed out that the conducted campaign contributed to awareness raising of employees regarding harmful chemicals in articles, and encouraged the consumers to request the information regarding substances of very high concern in order to choose safer articles for their kids and families. “During the campaign “The fight to know!” and after accomplished consumer-trader communication by the request for information on the content of SVHCs in articles, national HelpDesk in Serbia received an increased number of calls and e-mails. 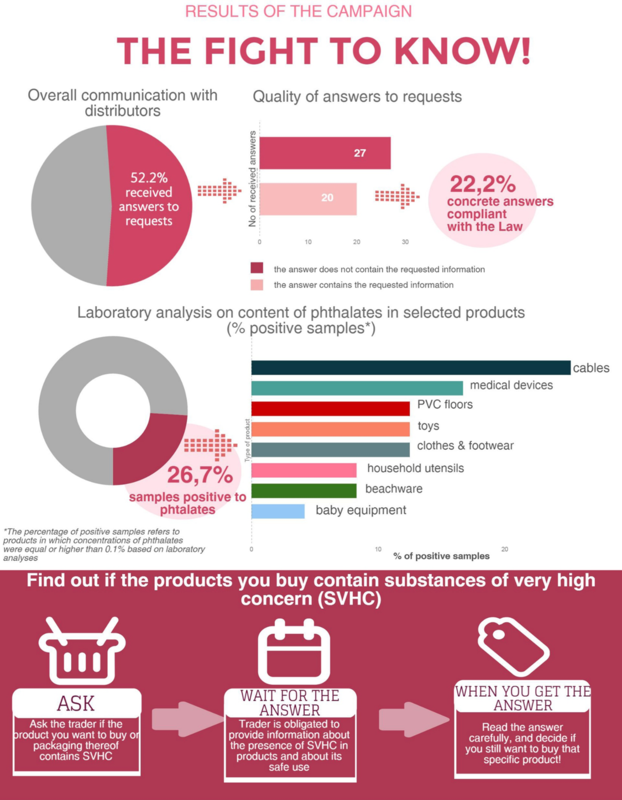 Questions referred to the consumers’ right for information on SVHCs in articles and higher concentration of phthalates in toys and baby care products. At the same time, this topic attracted the attention of traders as well as consumers. For example, one question posed to national HelpDesk by a trader referred to possible presence of SVHCs in curlers for notebooks and consumers’ right for information”, said HelpDesk representative. “This campaign helped expand not only mine, but also my family’s knowledge on safer alternatives, chemical health effects, and pictograms. When purchasing a range of resources for my household, I will pay attention to all information provided to me from the instruction manual, including pictograms. The most meaningful part was the successful education that was provided to my eldest son“, said Jovanka Nikolic, Consumer Assotiation in Serbia (APOS). “This campaign gave me a completely different view on the use of chemicals and a better understanding on the law which I did not know in detail. Not only will I share this knowledge with the consumers, but also with my friends, neighbors, my child’s kindergarten teachers. 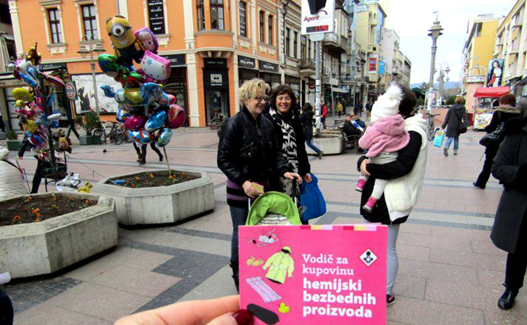 In other words, people who I am in daily contact with“, said Helena Milicevic, Consumer Assotiation in Serbia (APOS).